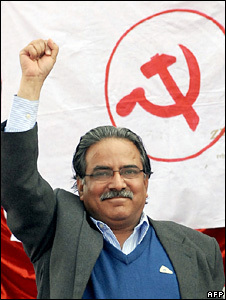 BBC: In the past Maoist leaders had vowed not to keep any private property. They handed over their private properties to the party. Now, what will you do to your salary that you will be drawing as prime minister? That (money) will go to the country and the people. It will be deposited in the party treasury. Except some amount for the general upkeep, the salary will be deposited in the party treasury. Then, how can one be assured of the right to private property under your government when you are yourself are not keeping private property? We do not believe that private property should be abolished. But we believe that the leadership must keep away from making money to ensure that the properties of the people are protected and promoted. What three things you will do in the next three months that will make a difference to the people? First, a special committee will be announced to facilitate the integration (of the army) and rehabilitation within six months as part of moves to take the peace process to a logical conclusion. Second, the process of constitution making will be expedited in three months. Third, programs to provide immediate and long-term relief will be announced. Given that the army integration is being seen as a very sensitive issue will you let the current army chief General Rookmangud Katawal complete his tenure? The demand of the time is to exercise maximum restraint. The country will suffer by any move that breeds bitterness at this juncture. So the suspicions about the army chief being sacked are misplaced? He will not be sacked, will he? That will not happen. As long as everyone including the army, the police and the other officials remain committed to the people's mandate on democracy, peace and change, no one needs to feel insecure. There will be no prejudice against any. How will you handle the army integration? The Nepali Army seems to have its own ideas about this. How will you merge your combatants into the national army? Now that I have become prime minister I have been travelling with the army security. I have found a serious commitment and sense of responsibility in the Nepali soldiers. I don't think that we will face any problem in taking this (integration) process to a conclusion. If you had so much faith in Nepali Army, why did you distrust the NA and, instead, induct your combatants of the People's Liberation Army (PLA) for your personal security? I never showed such distrust. I never wanted to show any bit of distrust towards NA or police or PLA or armed police. Since last two years armed police and PLA personnel had been providing security to my residence in Naya Bazaar. This was an issue that needed a technical solution. I do not want to suspect anyone or make anyone feel humiliated. The PLA also should not feel that they have been orphaned now that I have become Prime Minister. I am quite sensitive on this matter. Both PLA and NA understand the issue very well. Among the 20,000 Maoist combatants in the cantonments, how many will be accommodated into the Nepali Army. What happens to the rest? The PLA combatants who are staying in the cantonments and who have been verified by the United Nations are all eligible for rehabilitation and integration. According to our latest understanding each and every PLA combatant will be given the freedom to choose whether he/she wants to return home or engage in other professions. Therefore, I am not in a position to say how many PLA combatants will be integrated and how many of them will return home. How long will the ex-King Gyanendra be allowed to stay in the Nagarjuna palace? We are discussing this matter. The cabinet has just been expanded. It will take up the issue soon. Will you re-open the probe into the palace killings (of 2001)? This issue will be raised at the Constituent Assembly. There have been no satisfactory answers yet to the people's serious questions about the incident. Perhaps the people could raise similar questions about you also? Maybe. But the people of Nepal have already justified our action -- you call it civil war or people's war -- through the Constituent Assembly verdict. Have the people ever justified the palace killings? Do you ever feel that you hands are stained with blood? Sometimes in the event of grave mistakes on our part, I was emotional. But what is more important is the great process of transformation and the class, ethnic, regional and gender consciousness which have come about through our movement. So I do not feel the need to repent. Would you have visited China first if it had not hosted the Olympic Games? Let's not get into hypothetical questions. Since China is our neighbour and since we could not attend the inaugural ceremony of the Olympics I went there for the closing ceremony. Anyway, it would not have been easier for me to go there first if there had been no Olympic. Since China is the land of your inspiration Mao Zedong, you must have harboured wishes to travel there? I would be lying if I said no. What do you want to do with the 1950 Indo-Nepal treaty? Nepal has become a republic passing through big changes since the Rana regime. So, the 1950 treaty should be clearly reviewed. It cannot be kept in the present form. What are the provisions that you do not like in the present treaty? I am engaged in consultations on my visit to India soon. So, I do not want to reply to your question at this point. When are you visiting to India? I am going to attend the UN General Assembly. I will travel to India before that. You used to claim that different power centres were blocking your ascent to power. Have you defeated those centres now? I cannot use the same language as I am prime minister now. I have said on many occasions that had any other party won the election, nothing would have stopped the formation of a new government within a week. It took four months for us. You have defeated the king and elbowed out Girija Prasad Koirala. Do you feel that you have mastered the policy of 'use and throw'? I am pained by the allegations that we engage in ``use and throw''. I never think that I have cheated anyone. But in course of advancing my cause, I might have made compromises and come closer to one or another at different times. But there was never any conspiracy there. It was our philosophy of cooperating with others to defeat the primary enemy. There are two schools of thoughts within your party -- one favouring the people's republic and the other favouring the democratic republic. Which one will prevail? That is not the case. There is no illusion within our party regarding our ultimate goal of establishing a socialist communism. However, in the current national and international circumstances, we have decided to move ahead by institutionalising the federal democratic republic. So, you want to establish a people's republic by means of the state of the democratic republic? We will definitely attempt to establish a people's republic by institutionalising democratic republic and through the legitimate means like elections. Once we attain that, we will then work to achieve socialism and communism. Will there be a people's republic if your party wins a majority in the next election? Let's not understand this in a provocative manner. We will definitely try our best to ensure that the new constitution will be as close to the ideal of people's republic as possible. I believe that the constitution would pave the way for a people's republic, socialism and communism. How can it pave the way for communism when you have said there will be guarantees of all kinds of political freedom? We have concluded that socialism without multiparty competition and political freedoms cannot survive. We have learned this from the experiences of Russia and other countries. What are you talking about, socialism or communism? I am talking about socialism. A lively society can be built only if there are political freedoms and competitions within socialism. Communism is something like a heaven where there is neither a class nor a state nor an army. It will take hundreds of years to reach there. You are not in a mood to step down as party chairman even after becoming PM. Why? Certainly since I will not be able to devote adequate time and energy for the party after becoming the PM, other comrades will have to take more responsibility. But there is no rule anywhere in the world that the party chief has to step down when he becomes PM. Besides, ours is a party that believes in central and unified leadership. So there is no question of abandoning one responsibility when taking up another. You once publicly said that top leaders will not join the government and act like Mahatma Gandhi? What I said that that will happen only after a people's constitution and a stable government are put in place. We believe that a leader does not need to stick to the position of a prime minister or a president once the revolution is completed, constitution is written and the country cruises on a stable course. Politicians are smart in playing with words, aren't they? Not at all, I have only tried to reply in a very direct manner. How long will your government survive? It will continue till the constitution is written and the peace process is completed. I believe our party will win majority, even two-thirds majority in the next election. Then, our government will continue for another five years. We will improve our performance during that period. There will come a situation where people will start thinking that Maoists alone can run this country. In the subsequent election, we expect to win 90 percent votes and we will continue in power for many decades. You have high expectations. Do you believe they will be fulfilled? Definitely. We have strong faith in people. We are devoted to the nation and the people. No one can severe our relation with the people. Interview translated from Nepali by Sanjaya Dhakal and Sushil Sharma.